Ecclesiastica is a scientific periodical by University of Prešov Centre of excellence for socio-historical and culture-historical research published by University of Prešov. Historia Ecclesiastica publishes solely academic papers (studies) dealing with the history of churches and religions in the territory of Slovakia and other central European countries; materials or sources related to such topics, scientific literature reviews and information on scientific events relevant to the field of church and religion history. Scientific works, materials and regular columns (literature reviews, annotations, reports) are published in Slovak, world language, alternatively in Czech, Hungarian or Polish languages. 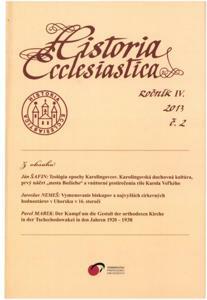 História Ecclesiastica is published on a bi-yearly basis.